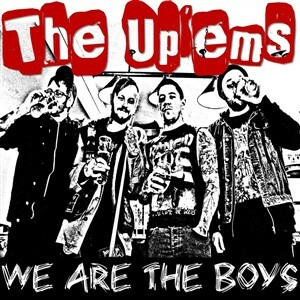 The Up ‘Ems are a new four piece street punk band from Basingstoke England and since their formation a couple of months ago they have played a handful of shows and have just released their debut EP ‘We Are The Boys’ which features 5 tracks clocking in at just under 19minutes and if you are a fan of street punk then you are in for a treat as ‘We Are The Boys’ is a solid, fast and furious punk EP full of punk rock attitude, epic riffs, gravely vocals, gang backing vocals and enough oi oi’s to get the crowd on board at future gigs. Now I have known the Up ‘Ems front man Jim Bones for a fair few years now due to the fact that we both loved punk rock in our teenage years and both grew up going to as many 4FT Fingers gigs as possible back in the day and as the years went on Jim became a roadie for a few bands and also formed his own band Zerohour and joined the likes of The Strawberry Blondes and the Black Bullets before taking time away from the scene which obviously did him good as The Up ‘Ems is the type of band Jim has been destined to play in for years. The Up ‘Ems are made up of Jim Bones on lead vocals and guitar, Al on backing vocals and guitar, Daz on backing vocals and bass and Pozi on backing vocals and drums and each and every member of the band ooze in talent and help make The Up ‘Ems the edgy punk rock band they are. The EP opens with ‘No Future’ and after a quick shout out of “I do the 1,2,3,4’s” the fast paced riffs and epic instrumental work kicks in as The Up ‘Ems take you on a huge sounding punk rock journey, as soon as Jim Bones vocals come in you can’t help but fall in love with the raw gravely angst ridden vocals he has adopted and the gang backing chants of “oi,oi,oi” which the rest of the band execute in a perfectly timed fashion. ‘Back Against the Wall’ is vocally one of the strongest tracks on the EP as the vocals flow so well from start to finish and the additional gang vocals which come and go throughout the track really adds to the punk rock dynamics of the band. ‘Young Soul Rebel’ is a spot on punk rock anthem as the band sing about being punk rock hooligans with tattooed knuckles and ripped up shirts. ‘Bad Reputation’ is a fast and fun song which is bound to get the pit flowing on the live circuit. The EP comes to a close with the EP title track ‘We Are The Boys’ which sees The Up ‘Ems save the best till last as ‘We Are The Boys’ is their anthem and is the song that I can imagine being the final song at each and every one of their gigs as they unleash the last ounce of punk rock energy they have at each and every gig they play, the song is a fast and furious melodic anthem and has a hell of a lot of potential for crowd participation on the live circuit and that is why I can see ‘We Are The Boys’ becoming The Up ‘Ems anthem. Overall I have been secretly eager to hear music from The Up ‘Ems since Jim Bones started teasing his new band on social media and due to moving and various other adult things happening in my life at the moment it took me longer than anticipated to give the band a listen but I am glad I did as I am totally hooked on the band and can’t wait to see them on the live circuit at one of the many sweaty toilet sized venues across the UK which I am sure they will be playing throughout the year. 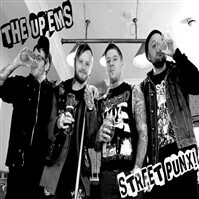 If you like your punk fast, melodic and full of oi, oi’s then the Up’ Ems will be right up your street and equally if you are a fan of Rancid, Anti-Flag, Social Distortion, The Bouncing Souls or any of the many great UK skate punk bands form the 00’s then give The Up ‘Ems a listen as The Up’ Ems are clearly heavily influenced by these bands and most importantly they write, record and play the music they want to play.